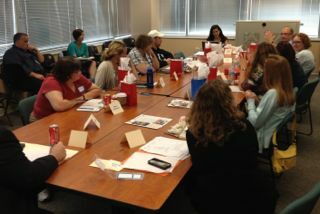 Recently the Carnegie Science Center (CSC) sponsored a meeting at WISER with some of the region's top math and science middle and high school teachers. WISER, in collaboration with the CSC, is developing a permanent exhibit at the CSC's facility on Pittsburgh's North Shore. This exhibit will encompass hands on activities for both children and adults. The teachers are advising the CSC and WISER on the development of these activities to provide an interactive and educational experience that will show students a wide variety of aspects of healthcare, the human body, and medical simulation. The teachers were able to observe a WISER Crisis Team Training course, which included a team based scenario and detailed debriefing. The teachers then brainstormed on potential aspects of simulation that could be applied to the project. While it is in its early stages, the staff and faculty of WISER are excited for this unique collaborative opportunity. Stay tuned for further developments!